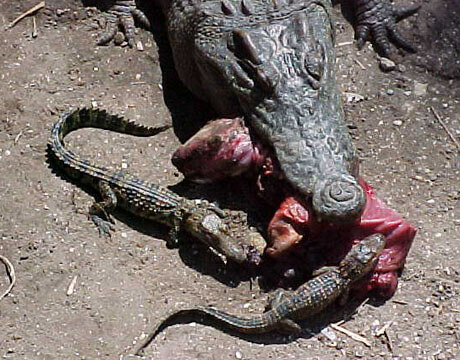 Crocodilians feeding their young? : More and more we are realizing how closely birds and crocodilians are related. They have many similar adaptations and behaviors. However one distinct difference is that crocodilians are not known to feed their young. Unlike most birds, hatchling crocodiles are ready to feed on their own soon after hatching. In spite of this, there have been occasional observations that may suggest that some parent crocodilians provide a little extra help to their offspring. McIlhenny, in his 1935 book, claimed to have seen American Alligators feeding their young on eight different occasions. A private individual in Florida claims to have seen his broad-snouted caiman, Caiman latirostristearing pieces of meat from a large feeder rat and feeing the smaller pieces to their hatchlings. Blohm, in 1982, said that he witnessed an adult Orinoco crocodile, Crocodylus intermedius offering food to hatchling animals. On two occasions, we have witnessed our adult female Siamese crocodile allowing her hatchlings to eat meat from her mouth. This has only happened twice in almost two years, and did not occur until the hatchlings were more than a year old. The adult Siamese crocodiles are shifted off exhibit when they are fed. This gives the keepers a chance to count the hatchlings, clean the exhibit, and trim the plants. Both adults usually swallow their food almost immediately. However, on these two occasions the female still had a large piece of nutria in her mouth when she was released from the shift cage. The female sat for more than an hour with the meat protruding out of her mouth, allowing the hatchlings to tear off small pieces of meat. The adult male attempted to take the meat away from the female, but she just got up and walked away. Once, she even got in the pool to avoid the male’s attempts, but she crawled right back on the bank and held the meat in her jaws until the hatchlings began feeding again. Many people have read my account of this event, and there are many skeptics that think I might be exaggerating what I saw. However, once they see the event captured on video, there is no doubt that the female allowed the hatchlings to feed from the meat in her mouth. I do not pretend to know what this means. I am not assuming that all crocodilians feed their young, or even that this particular female intended to feed her young. I can only say that she did not mind the hatchlings eating her meal. It is entirely possible that she was just not hungry, and decided to hold the meat for later. The adult male in this exhibit has been a great father to the hatchlings; he is protective and cautions around them. He is also very food motivated and has never been seen attempting to share his meals with the hatchlings. In addition to attempting to steal meals from the female, I have even seen him try to take the occasional large piece of meat from the hatchlings. He is very gentle about it; trying to only get a hold of the meat without touching a hatchling, even to the point of quickly pulling his head back if a hatchling was accidentally in the way. To prove his good intentions, I have seen him basking with his mouth open just after eating. Hatchlings have crawled in his mouth looking for the meat that they can still smell. One even tried to bite his tongue. The male is very patient, but really does not like the young crocodiles in his mouth, and he gently turns his head and shakes them out. Crocodilian behavior is often overlooked because we tend to think of them as prehistoric, and therefore too primitive to have complicated behavior. We have also been quick to dismiss all of a particular author’s writings, because they were not completely accurate in everything they wrote. I am not the first to suggest that crocodilians swallow under water or that they may feed their young, but other authors have often been ignored because of errors elsewhere in their observations or because so few others have witnessed these behaviors for themselves. It is my assertion that crocodilian behavior deserves a more in depth look, as I am confident they have much more to teach us. I am very grateful to the animal staff at the St. Augustine Alligator Farm for being so observant. This paper is made up of observations that cold have very easily been overlooked if it were not for their diligence and dedication. This to the Reptile department: Shannon Chapman, Jim Darlington, David Kledzik, Thomas Rexroad, and Shelly Triplett. I would also like to thank David Drysdale for his continued support of our efforts. Lastly, I would like to thank my mentor, Dr. Kent Vliet for his knowledge, insight, and encouragement. DAVIS, et al. 2001 Multiple paternity and Mating Patterns in the American Alligator (Alligator mississippiensis). Molecular Ecology April 2001.